1) (Groton House, Suffolk). Az. a chev. erm. betw. three arrows paleways, point downwards or, feathered ar. on a chief of the last three martlets sa. a canton gu. charged with a mullet gold. Crest—A cat’s head full-faced, erased near the shoulders ar. spotted sa. holding in the mouth a rat of the last. Motto—Vitae via virtus. 2) (Edwardston Hall,co. Suffolk). Az. a chev. erm. betw. three arrows or, feathered and barbed ar. on a chief of the last three Cornish choughs ppr. a canton gu. charged with a mullet of the third. Quartering gu. a cross patoncee betw. four cinquefoils or, for Manning. Crest—A cat’s head erased guard, tabby, in the mouth a rat ppr. Motts—Vitas via virtus. 3) (Spaldingholme, co. York, 1584). (Wharton, co. Lancaster). Az. a chev. erm. betw. three arrows’ heads downwards ar. on a chief ar. three daws sa. and upon a canton gu. a mullet or. Crest—A cat’s head erased affrontee ar. spotted sa. in the mouth a rat courant of the last. 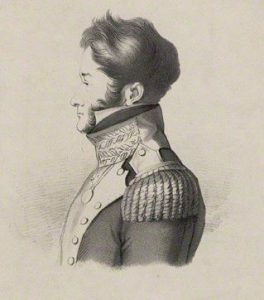 4) (Dawson-Damer) (Earl of Portarlington). Az. a chev. erm. betw. three arrows paleways, points downwards ar. on a chief of the last three martlets sa. a canton gu. charged with a mullet gold. Crest—A cat’s head, full faced, erased near the shoulders, of a tabby colour, holding in the mouth a rat sa. Supporters—Two heraldic tigers ppr. Motto—Vitae via virtus. 5) (Earl of Dortrey). Quarterly, 1st and 4th, az. on a bend engr. or, three martlets gu. ; 2nd and 3rd, az. three torches erect ppr. Crest—An estoile of six points or. Supporters—Dexter, an Irish wolf dog; sinister, an elk, both ppr. collared and chained or. Motto—Toujours propice. 6) (Penrith, co. Cumberland; granted 1761). Az. a chev. erm. on a chief ar. three Cornish choughs ppr. Crest—A demi talbot erm. eared az. holding an arrow or, flighted and pointed ar. 7) (London). Az. on a bend engr. or, three martlets gu. Crest—An estoile or. 8) (Allan Bank, Grasmere, co. Westmoreland). Same Arms. Crest—A cat’s head erased, tabby and full­faced. 9) (Azerley, co. York, 1612). Erm. on a canton az. a stag lodged or. Crest—On a mount vert a talbot statant sa. 10) (Sutterby, co. Lincoln; confirmed 12 June, 1664, to James Dawson, Esq., of Sutterby, co. Lincoln, and of Ballina Courte, or New Forest, co. Tipperary). Ar. two pales sa. a chev. gu. on a canton of the last a battle axe or. Crest: A dexter arm embowed in armour ppr. garnished or, holding in the gauntlet a battle axe of the last. 11) (co. Lincoln, Reg. Ireland). Or, three pallets sa. a chev. ar. on a canton gu. a battle axe of the first. Crest—A tower ar. alighting thereon a falcon wings addorsed sa. 12) (Low Wray, near Hawkshead). Same Arms. Crest—On a chapeau gu. turned up erm. a cockatrice or. Ancient Crest—That of Dawson of Sutterby. Motto—Deeds, not words. 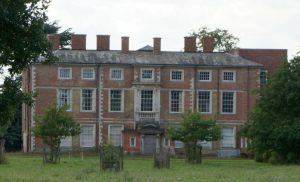 13) (Launde Abbey, co. Leicester). On a bend engr. ar. three birds sa. Motto—Manus haec inimica tyrannis. 14) (Moyola, formerly Castle Dawson, co. Londonderry). Az. on a bend or, three mullets gu. Crest—An estoile of six points or. Motto—Toujours propice. 15) (Westropp Dawson, Charlesfort, co. Wexford; exemplified, 1859, to Walter Montiford Westropp, Esq., on his assuming, by royal licence, the additional surname of Dawson). Quarterly, 1st and 4th, az. on a bend betw. two estoiles or, three daws sa., for Dawson; 2nd and 3rd, sa. a lion ramp. ar. ducally crowned or, in the dexter chief point an annulet of the last, for Westropp. Crests—1st: On clouds ppr. an estoile, as in the arms, an escroll above, with the motto, Toujours propice, for Dawson; 2nd: An eagle’s head couped erm. charged with an annulet gu., for Westropp. Motto—Tourne vers l’occident. 16) (London). Gu. or a bend engr. or, three martlets. Crest—A talbot pass. 17) (Newcastle). Az. on a bend engr. ar. three daws (another, ravens) ppr. Crest—A daw ppr. 18) Az. on a bend engr. or, three martlets gu. Crest—A cat’s head erased, tabby, in the month a rat ppr. 19) Az. a chev. erm. betw. three broad arrows or, feathered ar. 20) (granted to Charles James Dawson, Esq., of Melbourne and the Inner Temple, barrister-at-law). Quarterly or and erm. on a bend dove-tailed az. an estoile betw. two martlets of the first. Crest—An estoile betw. two ears of wheat slipped all or. 21) (granted to Benjamin Franklin Dawson, Esq.). Az. on a saltire indented ar. five daws sa. Crest—A buckle fessways or, therein a daw sa. Motto—Alte volat. 22) (granted to Christother Holdsworth Dawson, Esq., of Weston, co. York). Erm. three pallets engr. gu. on a canton sa. a stag lodged ar. Crest—Upon a mount vert in front of a quiver palewise or, with arrows therein ppr. a talbot statant sa. charged with two buckles gold. Motto—Perseverando. 23) (William Mosley Dawson, Esq.—formerly Perfect —of Lancliffe Hall, Giggleswick W.R .co. York). Vert on a bend invected double cotised plain or, three martlets of the first. Crest—Upon a staff ragoly fessewise or, a cat’s head erased affrontee ppr. gorged with a collar flory counter-fiory or, and holding in the mouth a rat fessewise also ppr. This is a baptismal surname meaning “the son of David”, deriving from the nickname Daud, which later became Daw or Dow. It is likely a contraction of the surname Davison or Davidson. The name David, in turn, was a Hebrew personal name meaning “beloved of Jehovah”. The name, an alternative of Dodavehu, was born by ancient Kings in Israel, and became popular throughout Europe when Christianity spread throughout the continent. A second theory is that it is a corruption of the Norman-French surname D’Ossone, with Ossone meaning a town in Normandy, France (possible Osonvilla near Dieppe). The name would have came to England in the 1200s AD in a wave of immigration following the Norman Conquest of 1066 AD. The name was mostly found in Cumberland, Westmoreland, Durham, West Riding, Lincolnshire, and central Scotland, with Daw or Dawes confined to the west of England. Common spelling variations of this last name include: Dowson, Daweson, and Dauson. The earliest recorded bearer of the surname was Thomas Daweson who was recorded in the Court Rolls of the Manor of Wakefield in 1326 AD. The Poll Tax of Yorkshire from 1379 lists several bearers of this surname and its early forms: Magota Daudwyfe, Matilda Daudoghter, Beatrix Daudewyf, Johannes Dauson, Robertus Dauson, Johanna Dowedoghter, Osbarn Daweson, Walterus Daweson, Robertus Doweson, and Willelmus Daweson. Bernard Burke’s book “Peerage and Knights” discusses two branches of this family. The first is Dawson of Appleton Roebuck. Sir Benjamin Dawson, the 1st Baronet, was born in 1875 and was created a baronet in 1927. He married Margot Elinor, the eldest daughter of Clayton Louis Glyn, in 1921 and had two issue with her: Geoffrey Leo Simon, the 2nd baronet, and Christopher Michael Edward (born 1927) who was Captain Welsh Guards. Edward was succeeded by his elder son in 1937. The second family mentioned is Dawson of Edwaterbury. The lineage traces back to Sir Arthur Trevor Dawson, 1st Baronet, born in 1866, the son of Hugh Dawson, Barrister-at-Law. He married Louise, the daughter of John Miller grant, in 1892. Together they had two issue: Hugh Trevor and Arthur Trevor. Hugh, born in 1893, became the second baronet when he succeeded his father in 1931. In 1918, he married Vera Anne Lock, daughter of Sir Frederick Loch, and with her had three issue: Hugh Halliday Trevor (1931), Avice Louise Trevor (1931), and Patricia Elinor Trevor. The younger son Arthur Trevor who did not become Baronet married Iris, the daughter of John Micklem, and later Eva May. 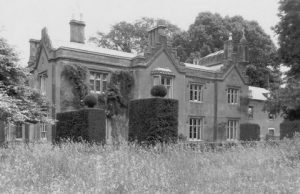 Burke’s book “The Landed Gentry” discusses three branches of this family: Dawson of Launde Abbey, Dawson of Groton House, and Dawson of Moyola Park. 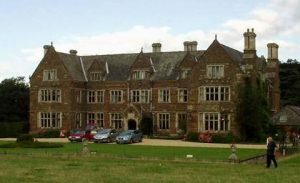 The first family, of Launde Abbey, traces its lineage back to Henry Dawson, of Breedon, in county Leicester, who died in 1577, leave issue, including a son named Griffin. Griffin married Jane Armston and had five sons and one daughter with her. The eldest son was Edward Dawson, born in 1628, who married Isabel, the daughter and heir of William Atkins, and had seven issue with her. Their eldest son was Atkins Dawson, born in 1657, who married Margaret and with her left seven children. The eldest was Edward Dawson, Esq. of Whatton, who was born in 1694. He served as High Sheriff in 1726, and married Elizabeth Wilde in 1717. He left five children, including Edward Dawson, born in 1730. Edward served as High Sheriff in 1768 and married Mary Grundy in 1770. He had a daughter named Sarah and a son named Edward. Edward was born in 1778 and served as High Sheriff in 1807. 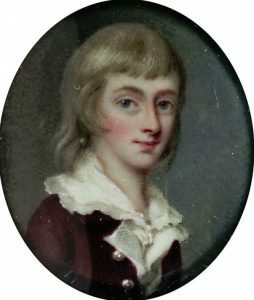 He married Susan Phillipps and died in 1815 leaving several issue: Edward, Henry (1806), Charles Thomas (1808), William and Spencer (1815). Edward was his heir, born in 1802, who was High Sheriff in 1839 and served as a Member of Parliament in South Leicestershire in 1832-34. He married Mary Finch in 1828, the eldest daughter and co-heiress of John Finch Simpson. Together they had Edward Finch, Charles Alfred (1838), Mary, Harriet Elizabeth, and Caroline Susan. He later married Annie Forbes, and had oissue with her as well: Stewart (1848), William Henry (1849), Henry Coleridge (1851), James Edward Le Strange (1853), and Annie Jamesina. Edward Finch Dawson, Esq. of Launde Abbey in count Leicester was High Sheriff in 1867. He married Emily Sarah Burnaby, and had seven children with her: Edward Alfred (1865), Eustace Charles (1868), Lisle (1873), Hugh Burnaby (1876), Gertrude Mary, Emily, and Helen Maud. The second family, of Groton House, begins with a mention of Cuthber Pilkington, Esq. 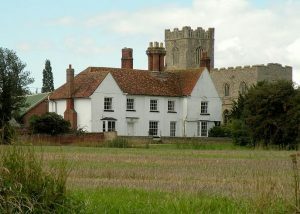 of Groton House in county Suffolk, born in 1857. The lineage traces back to Thomas Dawson, who married Eleanor Forster and had two issue: Forster Dawson and Thomas Dawson. Thomas married Anne Manning in 1775 and with her had issue: Charles, George Augustus, and Anne Lovell. The Reverend George Dawson was born in 1792 and he married Louisa, the daughter and co-heiress of Sir Thomas Pilkington, in 1830. He was succeeded by his son Thomas Pilkington Dawson. Thomas was born in 1831 and in 1856 he married Emma, the eldest daughter of James King, and had issue with her: Cuthbert (mentioned above), George Augustus (1858), and Emma Gertrude (1861). He died in 1867. The third family, of Moyola Park, begins with mentioning Robert Peel Dawson, Esq. of Moyola Park, in county Londonderry, who was D.L. and J.P. and High Sheriff in 1850. He was a Member of Parliament from 1859-1974. He was born in 1818 and in 1848, he married the Honorable Mary Elizabeth, the daughter of Charles Brownlow. Together they had a daughter named Mary, who married Adolphus John Spencer Churchill Chichester, and had issue with him including Robert Peel Dawson. The family became established in Ireland in the early 1600s, when Thomas and Robert Dawson settled in there. Robert was Bishop of Clonfert in 1627. Thomas went to Ireland in 1601 from Temple Sowerby, Westmorland, and purchased the lands at Castle Dawson in 1633. He was succeeded by his son Thomas Dawson, a Commissary of Musters of the army, who died in 1783 and was succeeded by his son, Thomas Dawson. Thomas was a Member of Parliament for Antrim. He married Olivia Upton and was later succeeded by his brother, Joshua Dawson. Joshua was a Member of Parliament for Wicklow and Secretary for Ireland. In 1695, he married Anne Carr and has three issue with her: Arthur, William, and Mary. The eldest son was Arthur who was one of the Barons of the Exchequer in 1742. He married Jane O’Neil and died in 1775. He was succeeded by his nephew Arthur, born in 1745. In 1775, Arthur married Catherine, the daughter of George Paul Monck and Lady Araminta Monck. Her had issue with her: George Robert, Henry Richard, Arminta, Maria, and Isabella. George Robert succeeded him in 1822. George was born in 1790 and in 1816, he married Mary, the daughter of Sir Robert Peel, 1st Baronet of Drayton Manner. With her he had issue: Robert Peel, George Beresford (1819), Henry (1821), Francis Alexander (1821), and Frederick (1824). Burke also mentions two other families with this name in his book: Dawson of Ballyancourte (Massy-Dawson) and Dawson of Charlesfort (Westrop-Dawson). The book “Genealogical Guide to the Early Settlers” mentions five people bearing this last name: 1) Daniel Dawson of Ipswich who had widow Margaret in 1693, 2) George Dawson of Boston, a Quaker recorded in 1677, 3) Henry Dawson, of Boston, recorded as a freeman in 1641 (He was in the employment of William Hudson, Jr., who, when he went to serve in the Parliament’s cause against the king, left the care of his family two years to this young man in consequence of which he was brought into great peril of his life, as set forth in Winthrop II, 249. Probably he repented soon, for he was in October, 1646, restored to his rank), 4) Henry Dawson, also of Boston, was a solider in the company of Captain William Turner 1676, 5) Robert Dawson, of New Haven, CT, who married Sarah Tuttle and had with her John (1677), and later married Hannah, widow of John Russell, and with her had one son named Thomas (1693). Other early settlers in American include: William Dawson (Virginia 1607), Owen Dawson (Virginia 1622), and Gregory Dawson (Virginia 1701). Richard Dawson left the port of London to the Barbados aboard the Peter Bonaventure in 1635. Another Richard Dawson came to Virginia aboard the Phillip in 1635. Hugh Dawson came to the Barbados aboard the Expedition in 1635. William Dawson came, aged 25 years, aboard the Discovery in March of 1621. Georg Dawson arrived in Virginia in 1623 aboard the Southampton. Mr. Edmund Dawson was buried in the Parish of St. Michael’s in Barbados in July of 1679. Robert Dawson was registered as having 15 acres of land in the Parish of St. George. The family mottoes include: 1) alte volat, meaning “he flies high”, 2) deeds not words, 3) fidelitas regi et Justitia mihi, meaning “fidelity to the king and justice to myself” (born by Dawson-Suffield of Coverdale), 4) toujours propice, meaning “Always propitious” (of Castle Dawson), 5) vita via virtus, meaning “virtue is the way of life”, 6) manus haec inimica tyrannis, meaning “This hand opposes the rule of tyrants”, 7) tourne vers l’occident meaning “open toward the west”, 8) perseverando, meaning “preserving”, 9) vis in consilio meaning “Strength without wisdom collapses under its own weight”, and 10) laetus sorte mea, meaning “mine is a happy lot”. Later individuals granted arms include: 1) Alexander Dawson of Manor of Spaldington, Yorkshire, 8 Feb. 1563-4, 6 Eliz., by Flower, 2) John Dawson of Insterby (Sutterby), in co. Lincolnshire, Barr. Of the Inner Temple, now residing at Ballina-court, co. Tippy and Limerick, royalist, arrested by Cooke…his family of Sutterby, co. Linc, confirmed 12 January 1663-4, by Walker. Our family migrated to the Modern World Nova Scotia Canada from Scotland. Thank you!